As people age, they experience different physical challenges—whether in the form of a new injury or an older, recurring one. If someone you know is considering a move to an assisted living community, keep in mind that they won’t want to travel constantly should they ever require rehabilitation services. Instead, they should seek out a senior care facility that offers everything in-house. Making sure that their new home has all the resources they need to recover is beneficial to their comfort and, therefore, their health. 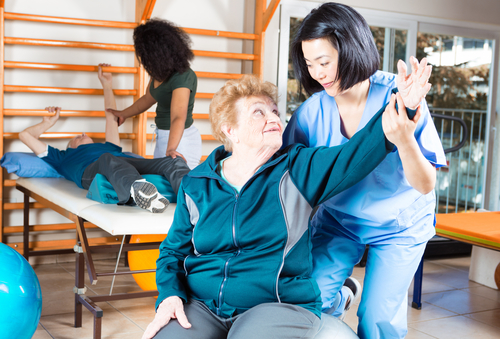 What Are the Advantages of Choosing an Assisted Living Community With Rehab Services? Traveling to an off-site rehab center can be difficult, especially if your loved one is facing complications that hinder their driving abilities. With on-site care, you won’t have to worry about them finding a ride and can rest easy knowing that they will have assistance making it to their appointments on time. You’ll also find it easier to connect with their physical therapist should you have any follow-up questions or concerns. Often, finding a rehab center involves an extensive amount of research into the doctors, the costs, and whether or not the facility meets your loved one’s specific needs. This can be a lot to handle if they have just had an accident. However, if you choose an assisted living community on the assumption that rehab services will one day be necessary, you can be assured of immediate, quality care should something unfortunate happen. Rehabilitation can be daunting, and sometimes frustrating, for the patients. But your loved one is likely to feel more comfortable in their session if they are already familiar with the environment and perhaps some of the people. Furthermore, their training will be physically tiring, and it is better for them if they can relax afterward rather than attempting a difficult return journey. Longhorn Village is committed to providing an all-in-one assisted living experience to residents of Austin, TX. They’re proud to be part of the University of Texas community, and their onsite health care center offers world-class medical services. Most importantly, they create a welcoming, comfortable home and community for seniors and take every measure to ensure their happiness. Call (512) 266-5600 today to speak with their staff. You can also visit them online to learn more about their senior living services or connect on Facebook for additional resources.